Think of a domain name just as you would a street address. We wouldn’t ask you to visit us at ID#2269304, but we would ask you to come and say hi at 8 Kent Street in Newmarket, Auckland. 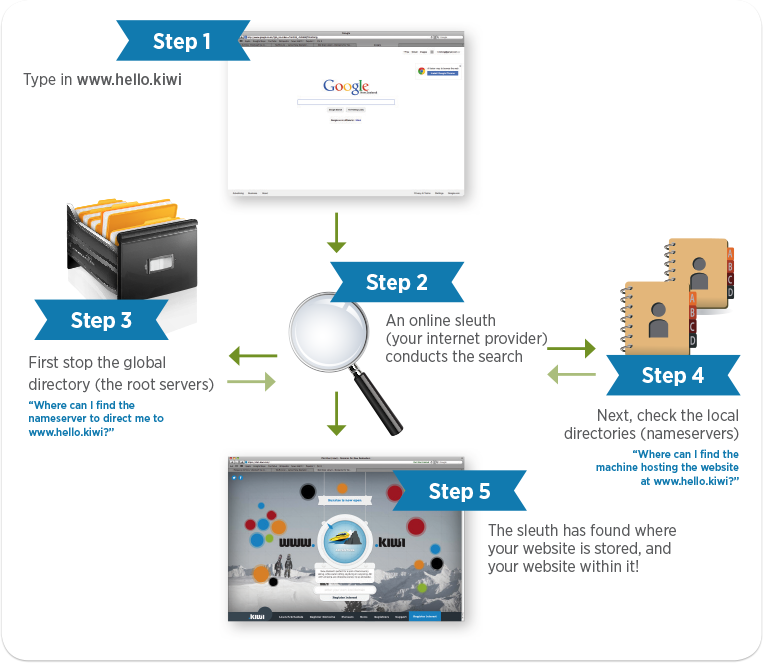 A (“Address”) Record –An A Record instructs people looking for your website what the IP address for your website is. From the moment you typed www.hello.kiwi into your web browser, not until now did your browser actually know where to find our website. The domain name is the street address “8 Kent Street, Newmarket, Auckland” in that it allows your web browser to find what you are looking for. 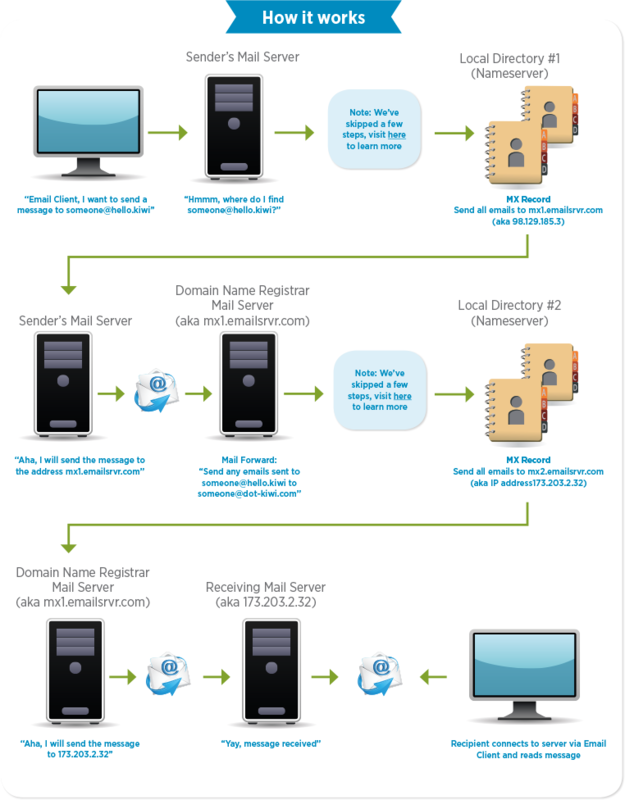 See “How domain names work”. Your email client is the teller at your local post office. Upon taking your order, the attendant takes your mail and places it in the appropriate post box for sending. 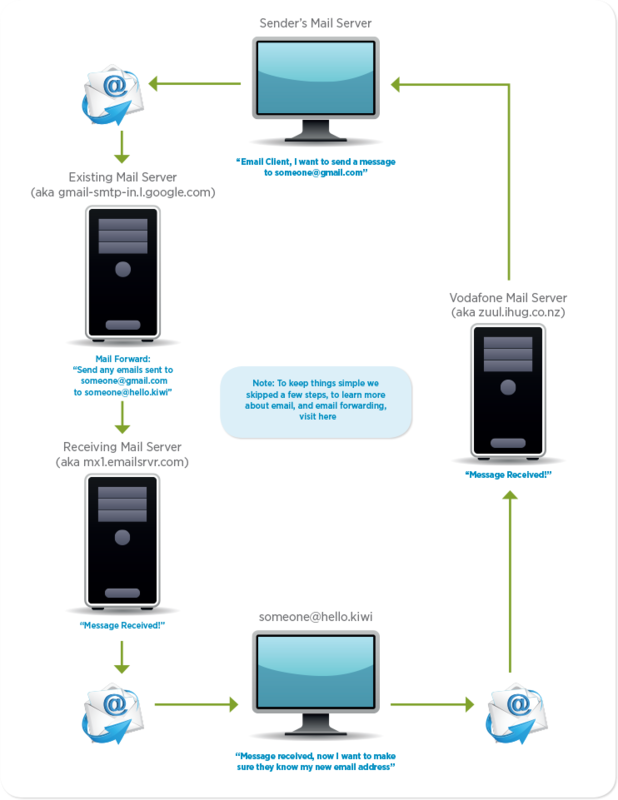 Similarly, your email client behaves as the interface between you and your mail server (see detail below). Think Microsoft Outlook, Gmail, etc. Think of it as being similar to a mail forwarding service, but online. Just like you could post a letter to a PO Box and have it forwarded automatically to 8 Kent Street, Newmarket, you could email someone@hello.kiwi and have it redirect to someone@dot-kiwi.com. This is who stores and presents your website for you. When you update your domain name, you need to tell your host to accept search requests for that particular domain name. Just like the post office itself, your mail server does all the hard work sending, receiving and storing your emails. 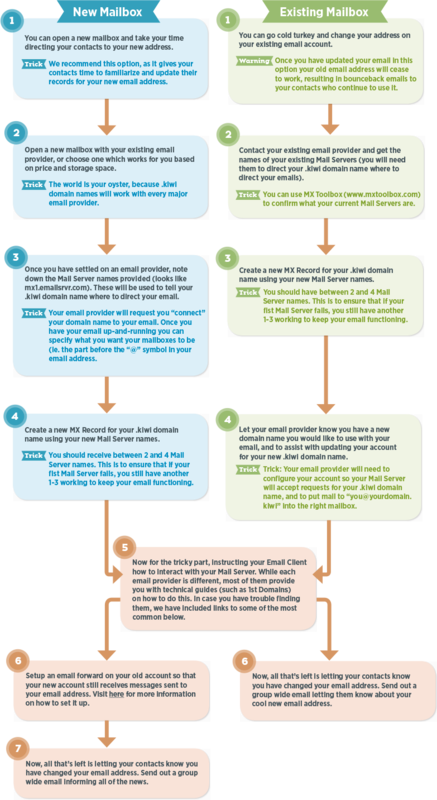 Emails are just files sitting in storage waiting to be read, and you need your Email Client (defined above) to access them and instruct your Mail Server to send/receive. When it comes to automatically forwarding emails, an instruction is saved on your domain registrar’s mail server which instructs it to forward all emails being received (at the address someone@hello.kiwi, for instance) to a new address (someone@dot-kiwi.com in this case). Imagine you were looking to send mail to 8 Kent Street, but that we only took mail at our PO Box. Similar to the process of finding 8 Kent Street, you would arrive at the local directory or “nameserver” and the MX record would instruct you to send mail to PO Box 8207 Symonds Street, Auckland. If you looked for the address of the office, you would end up at 8 Kent Street, but all sent mail would be directed to the PO Box. If you weren’t sure where to find 8 Kent Street, Newmarket, Auckland where would you look first? Perhaps you would check a national directory to find Auckland, then a city directory to find Newmarket, then a local directory to find 8 Kent Street? 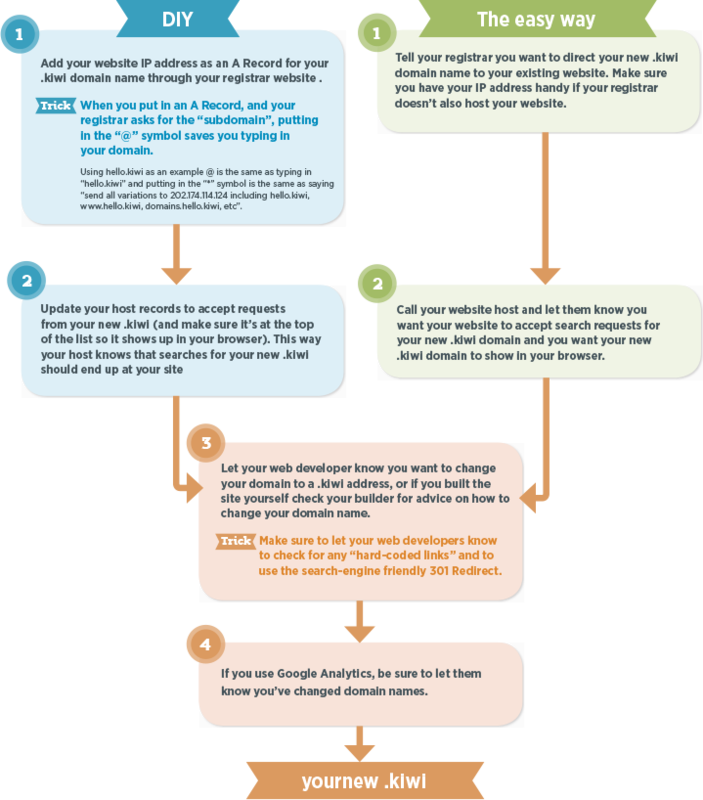 That is the very same process which occurs online, when you type in a domain name. The big difference: the directories are nameservers, and the address you are searching for is actually the IP Address of the machine hosting the website you are hoping to visit. Just like the building at 8 Kent Street, a Server represents the actual physical storage where your website, or email, is stored. Just like the ID#2269304 is to the building on 8 Kent Street is your IP Address to your server. Your host (above) typically provides you with a server, or space on a server to host your website. Imagine you looked in a physical directory for the address to “Dot Kiwi”, and instead you found “Refer to address located under Dot Kiwi Limited”. When your friends or clients type in your domain name (like www.dot-kiwi.com) they end up at your website, but see another URL of your choosing in their web browser (www.hello.kiwi for instance). 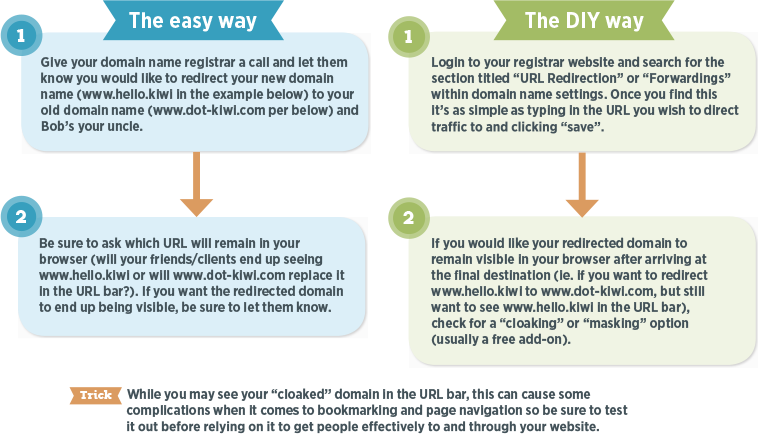 With some providers, you can even set it up so your “redirected” domain name (www.dot-kiwi.com above) remains visible in your browser. Looking through a web browser at the content on the internet is like looking through a pair of glasses at a physical directory booklet. If you take your glasses off, you can’t see that Dot Kiwi Limited is found at 8 Kent Street, just as without your web browser you could not see content on the internet. Adding your .kiwi web address will allow you to use this new domain while keeping your old domain up-and-running as well. Although it may seem complex, all you need to do is tell your local directory to send traffic looking for your .kiwi address to your website and let your website host know to accept traffic looking for your .kiwi address. We have provided brief instructions below to help make your transition a little bit easier. If you run into trouble at any point, don’t panic there are lots of resources out there to help. Your domain name registrar, your website developer, your website host, and of course us (Dot Kiwi) are all eager to help you should you run into difficulties. Be sure to refer to our useful terms if any of the terminology below appears confusing. We have provided brief instructions below to help make things a little bit easier. If you run into trouble at any point, don’t panic there are lots of resources out there to help. Your domain name registrar, your website developer, your web hosting company, and of course us (Dot Kiwi) are all eager to help you should you run into difficulties. Automatic email forwarding is a really easy, great way to advertise a particular email address, while actually using your preferred email provider such as Gmail. Think that you could tell people to email you at me@mybusiness.kiwi, and/or me@mylastname.kiwi, and receive the messages in your Gmail inbox? No need to advertise me649@gmail.com on your business card anymore, and you still see who originally sent you the message. Setting up your .kiwi email address is not a difficult task, and this guide will help you work through the process to make it as easy as possible. Whether it’s for business or personal use, using a .kiwi email address communicates to the receiver that the message being received is from someone with characteristics which are uniquely Kiwi.